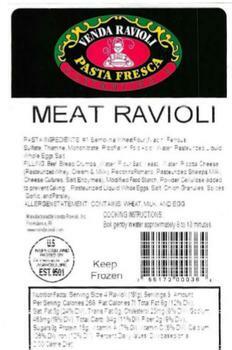 Venda Ravioli of Providence, R.I., is recalling approximately 672 pounds of frozen meat ravioli products. 16 oz. sealed trays of “VENDA RAVIOLI, PASTA FRESCA, COSTANTINO’S, MEAT RAVIOLI,” and a lot code and case code of 05318, 05418, 05518, 05618, 05718, 05818, and 05918. 16 oz. sealed trays of “VENDA RAVIOLI, PASTA FRESCA, COSTANTINO’S, Prosciutto & Provolone Ravioli,” and a lot code and case code of 05318, 05418, 05518, 05618, 05718, 05818, and 05918. The Meat Ravioli and Prosciutto & Provolone products subject to recall bear establishment number “EST.9501” inside the USDA mark of inspection. The Italian Sausage Ravioli and Osso Bucco Ravioli products do not have the USDA mark of inspection on the packaging. The recalled items were shipped to retail locations in Massachusetts and Rhode Island.